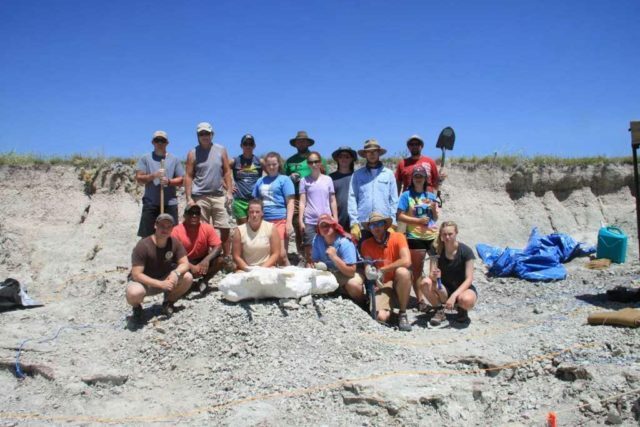 Digging up the bones of animals who roamed the earth millions of years ago in the Badlands was the adventure taken by ten Westminster College students and two professors this summer. Dr. David Schmidt, Associate Professor of Environmental Science and Geology, and Dr. Chris Halsey, Assistant Professor of Chemistry, led this three week fossil excavation trip from May 29-June 15. The site revealed a wealth of fossil material to recover because it was part of an ancient stream channel where deposition of skeletal material took place over hundreds or thousands of years. The Westminster group was able to recover at least three skulls (one nearly a meter long), limb bones and vertebrae from a variety of different-sized animals. Dr. Schmidt believes the high concentration of bone left in that area will provide recovery and research projects for years to come. Ruga thought the spectacular scenery on the trip, which included Badlands National Park, the Devil’s Tower in Wyoming, and the group’s field site in Nebraska was a high point. Woytus found the extreme change in temperatures at the site-hot by day and freezing cold at night-to be the biggest surprise of the trip. His greatest pleasure as the only sophomore in the group was getting to know his upper class fraternity brother Zach Thomas so well and finding out how much Zach knew about geology. The trip was not without excitement. Ruga tells about a huge cotton wood tree which fell across the road close to their tents. However, in spite of “roughing it,” all agreed the educational benefits of the trip were priceless. “These field courses allow us to learn concepts by actually seeing the forces of nature in action” says Woytus.